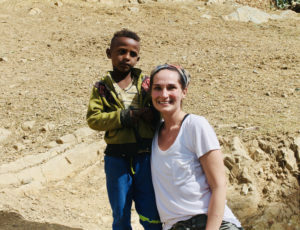 The high cliffs, rocky foothills, and desert plants make for a beautiful, yet treacherous landscape for the families living in the Northern Amhara region of Ethiopia. Our long days in a caravan of SUVs during our last trip to Ethiopia made me truly understand the vastness of the country. Although a country about the size of Texas, there was a constant feeling that its borders were endless. We would drive for what seemed like hours without passing a soul, a building, or even animal, to reach the small villages in the desolate, arid land. I often wondered how anyone could possibly survive in such remote locations where cactus is one of the few plants hardy enough to thrive. Along our drives, I would gaze out the car window and notice the dry valleys that were skeletons to once streams and rivers. And if we did pass water, it was meager and dirtied by the animals that were drinking and defecating in it. There was much time to think on these car rides. And while much thought was given to the true beauty of the land, I also found myself being thankful that I did not have to live in such an environment. The word “remote” is used in our house to describe the object needed to turn the channels on the TV, not as it would be used in one of the villages in Ethiopia. We are far from remote and, during those days of travel, I found myself thankful for that as well. I struggled at points to relate to the people living in the locations we visited on our trip, but in reflection I realized that was a choice I made in an attempt at self-preservation. Humans can only take in so much and, although unsuccessful, I attempted to shield myself from truly comprehending the depth of food and water scarcity the people we met faced. My family has access to clean water, schools, and medical services. It isn’t something we have to think about, long, or hope for. It’s at our fingertips and considered a need not a want. That is not so for more that half of the population in Ethiopia. According to a study conducted by Water.org, “only 42% of people in Ethiopia have access to clean water” and of those “only 11% have access to adequate sanitation.” The numbers are significantly lower in the rural areas of Amhara we visited on this occasion. It wasn’t until one of the last stops on our journey, that I could no longer barricade my life from that of the Ethiopian people. It was on a rocky path leading to a newly constructed well, that I met a little boy. He was quiet and a little shy at first but his eyes drew me in immediately. Even with the language barrier, through pointing and smiling you could tell he was kind and loving. I asked him to show me his farm, which appeared more like a corn field that had not been tended to for months; drought having taken over, leaving little to harvest. He cautiously guided me to the field, watching me with each step and pointing in the direction I should walk, so as not to fall. I asked about his family and siblings and even though much was unanswered or not communicated, I knew by our interactions that he was loved tremendously and cared as best as he could be given the conditions. As I thanked him for showing me his home and turned around to head back to the car, we I began to stumble. Almost as if it was instinct, the little boy grabbed my hand and, even once I steadied myself, he didn’t let go. We walked hand in hand through the fields and all the way to the car. Something inside made me ask him his age. He held up five fingers and my heart sunk. Five years old, just like Charlie. I just met Charlie, in Ethiopia. It became very real to me in that moment, that little boys across the world are no different than my own child. To say “those poor children in Africa just don’t live like we do” is not true. These children in Africa live, love, need, and hope just as all children do. Pretending the water crisis is a problem for the “Ethiopian people” is much easier than accepting that the water crisis is a problem for “our people.” We are all people and our needs are the same. But acknowledging that would mean that we as a people are responsible for helping remedy the problem. I felt Charlie in that little boy in the village. He reminded me that geographically we may be worlds apart, but we are all one people, ONE HEART. There was no self-preservation that could keep me from letting that sink in. If it is unacceptable for my Charlie to be without basic needs, it is equally unacceptable for this little five year old as well. Our children are our children, regardless of where they live. And every Charlie deserves clean water.